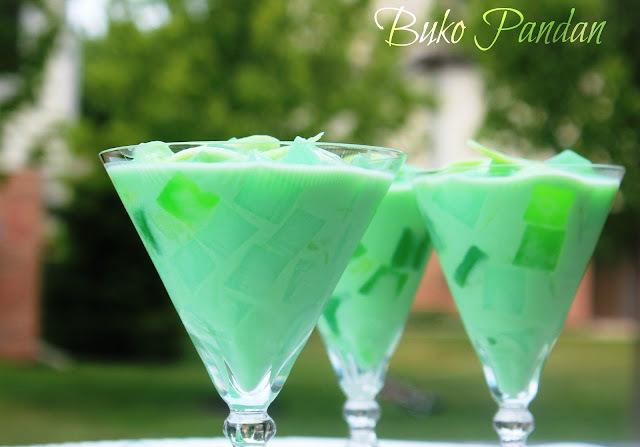 The buko pandan drink is essentially a street food sold almost everywhere in the country along with other ice-cold drinks like samalamig or sago't gulaman. Some people love to drink Buko- Pandan juice, especially Filipinos because in Philippines, this drink is one of the most popular beverages. Street vendors selling these native iced drinks are a common sight in the Philippines all year ’round but especially during the hot and humid summer months. While there is nothing even closely comparable to the experience of drinking coconut juice straight from the husk, if I have to choose a favorite among the native mixed iced drinks, I’d choose the buko pandan. It’s something that is very easy to prepare at home. 3. Mix the buko water, Fresh Milk, and condensed milk well. 4. Add the grated buko and prepared gelatin. 5. Serve best with ice cubes, coconut cream, and toasted pinipig.